Paraic Fanning at the final whistle of yesterday's clash in Nowlan Park. A TRIP TO Croke Park was not at the forefront of Paraic Fanning’s mind early on yesterday afternoon. 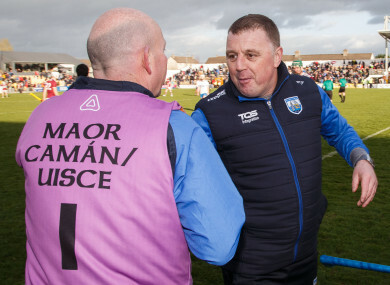 A first-half in Nowlan Park was spent watching on with a degree of anxiety as his Waterford team struggled to keep pace with Galway but a remarkable second-half metamorphosis, even despite being cut to 14 men, saw them engineer a league semi-final victory. As he got set to depart Kilkenny yesterday evening, making plans for a day out in Dublin against the current Liam MacCarthy Cup holders moved up to a high position on his agenda. “It’s not a bad place, no issue with the venue. It’s a national final, curtain raiser to the football, camogie on before it. We’re delighted. We have a game next week against the best team in the country in Limerick. Waterford hung in grimly during the first half to remain in the hunt. They trailed by two at the break, a satisfactory state of affairs considering Galway had largely dictated the terms with a fortuitous Stephen Bennett goal and a pair of wonderful Stephen O’Keeffe saves proving critical moments. “I know that’s his job but definitely in that first half he kept us in the game,” remarked Fanning about the input of his goalkeeper. “Because at that stage of the game, we were struggling. If Galway had got a goal there and gone eight or nine points up, we know it would have been a mountain to climb. But that said, every player has a job on the field. Stephen’s is to be brave and make decisions like that and fair dues to him, he did it and he got there. “We were disappointed, we were expecting to start pretty quick ourselves, especially after last week. Maybe there was just a little lack of energy early on, I thought we were maybe a little listless at times. After the dismissal of Mikey Kearney, Waterford rebounded impressively. “I do think the lads put in a massive shift and we had to,” agreed Fanning. “It certainly wasn’t easy. It was heavy going. We’d to do one or two tweaks to our shape there to try to get over the line. Email “'We have a game next week against the best team in the country in Limerick. But isn’t it brilliant to be there?' ”. Feedback on “'We have a game next week against the best team in the country in Limerick. But isn’t it brilliant to be there?' ”.